ALL INDIA CENTRAL BANK OFFICERS’ FEDERATION (AICBOF), the majority Officers’ Organization in our Bank, is completing 50 years of its fruitful existence in this year. It is another milestone in its glorious history of trials & tribulations, failures and achievements. It is not the number of years you live that matters, but how you live. In that respect every one of us could be proud that we belong to a trade union which is strong collectively and continues to serve the cause of the community without compromising its core values. Our Federation (AICBOF) & Confederation (AIBOC) does not depend upon the political support, being an apolitical organization, we run our own organization with the subscription collected from our own members & only strength that we have in our Trade union movement is the strength of the committed members like you who have always stood by the organization & fought against all the injustices against the officers and were able to get several facilities & rights over the last five decades of our existence. The Executive committee of the Federation in its meeting held at Chennai, decided to celebrate the YEAR-2014, as the GOLDEN JUBILEE YEAR of existence of the Federation. It was also decided to organize grand celebrations at all the Zonal/State & Regional headquarters during the year. Mumbai unit has been chosen as the first unit to roll-out yearlong GOLDEN JUBILEE celebrations of the Federation. Sri.R.C.Agarwal, former General Secretary of our Federation would be the Chief Guest. Sri.Harvinder Singh, General Secretary of AIBOC and Our Executive Directors Sri.R.K.Goyal and Sri.Animesh Chauhan would be the Guest of Honors. 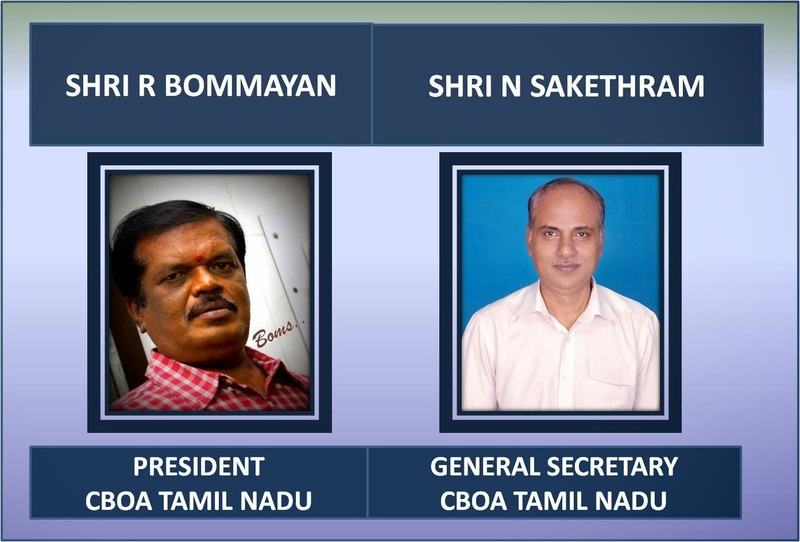 Central Bank Officers' Association, Tamil Nadu is the representative body of the Officers working in Central Bank of India, in the State of Tamil Nadu & Pondicherry and is affiliated with All India Central Bank Officers' Federation (A.I.C.B.O.F. 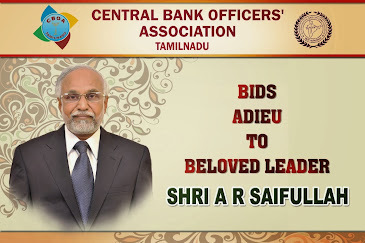 ), the recognised Majority Organisation representing Officers of Central Bank of India. A.I.C.B.O.F. is affiliated with All India Bank Officers' Confederation (A.I.B.O.C., which is the largest Representative Body in Supervisory Cadre in the World.